Property management is important all year-round. It doesn’t matter if you are in New England in the winter months or Florida in the summer, the point is, the work needs to get done. Commercial businesses rely on full service landscaping to keep their properties looking their very best. Whether you deal directly with customers on-site or if you meet with clients at your office, you want to have the best landscaping company in Northern Rhode Island working for you. Attention to detail, regardless of the temperature or weather, is key to the success of any business. The old saying, “you only have one chance to make a first impression” is very accurate. If your customers, clients or partners come to your location and see a property that is untended and neglected, it says a lot about the way you do business. If you aren’t currently working with professional landscaping companies in Rhode Island for commercial property maintenance, you will want to consider hiring someone right away. Eastern Landscaping, Inc. provides a variety of commercial services, including hardscape and landscape construction and design, as well as seasonal services. When it comes to full service landscaping, you might wonder what obligations a commercial property has during the winter months. While New England is known for all the snow and ice that we get each winter, there are still periods of time when there aren’t literal feet of snow on the ground. Keeping sidewalks, pathways, walkways, and driveways clear of snow and ice is an important part of landscape maintenance. These services are available from Eastern Landscaping, Inc., but we offer other services as well. Before the winter weather hits, we can perform fall services to clean up any trash, debris, leaves, branches, and other items to keep your property looking its best. Once the snow hits, we can also visit your property regularly to make sure that everything is neat and tidy. If you have branches, trees, bushes, or other shrubberies that become damaged by winter storms and winds, we can provide clean-up services in the winter months to prevent further damage or injury. Regular inspections of the property throughout the winter months will help to reduce significant repairs and further damage caused by melting snow and ice in the spring. For work like this, it pays to hire the best landscaping company in Northern Rhode Island to take care of the work for you, instead of stretching your maintenance staff to take care of property maintenance during this time of year. Due to legal liabilities associated with snow, ice, slush, and other potentially dangerous hazards on your commercial property, it is in your best interest to work with property maintenance companies who can provide these types of services. Also, when you hire a full service landscaping crew year-round to protect your property and help keep it looking it’s very best throughout the winter months, you help to increase the value of the property as a whole. 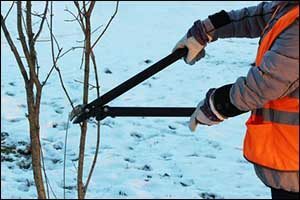 Other seasonal services, including tree trimming, property clean-up, removal of shrubbery and other plants, as well as end-of-season preparation for spring, can be layered in as needed to help get a jump start on the coming spring and summer seasons. Even if you don’t have customers or clients coming to your office, you will have employees, delivery persons, postal workers, and other visitors to consider. It is important to make sure that all walkways, driveways, parking lots, pathways, patios, steps, and other hardscaping elements are free of snow and ice to prevent accidents or injuries from occurring. While it may seem impossible to stay on top of these services, it can be done if you have the right landscaping companies in Rhode Island working on your side. Late falling leaves, twigs, acorns, and branches, whether they come from your property or get blown on-site from a neighboring business or area, need to be removed throughout the season to avoid becoming an additional hazard. Full service landscaping from Eastern Landscaping, Inc. can help with this type of winter clean-up services as well. Get a FREE No Cost Estimate from Eastern Landscaping, Inc. If you are interested in winter services from the best landscaping company in Northern Rhode Island, contact Eastern Landscaping, Inc. by calling 401-766-9035. Our team provides professional services to commercial clients throughout Northern Rhode Island, including Cumberland, Manville, Ashton, Smithfield, and in Massachusetts, such as the areas of Millville and North Attleboro. Call today to learn more about our full service landscaping options, as well as hardscape and landscape construction services to help keep your commercial property looking it’s very best all year-round.